One of the things you may have noticed by now is how much we LOVE comfort food here at Fat Boy Heaven. There is nothing that epitomizes comfort food for most of us more than a nice rich Mac and Cheese, but it would get boring if it was always the same. I decided that the saltiness of the feta might tie in nicely with the smokey saltiness of the bacon very nicely, and since feta doesn't melt, provolone was a nice neutral base cheese to develop the sauce. I added the dates as the milk was first coming to a boil so that some of the sugar would help sweeten the sauce to offset the salt. I went with a gluten free pasta here to help make this a healthier alternative for my readers, and lighter for my own family. It worked well in this dish, and in combination with the cheese sauce to make a dinner the family loved. As I hoped, the flavors worked together perfectly, with a light mellow flavor that allowed the feta and bacon to shine. 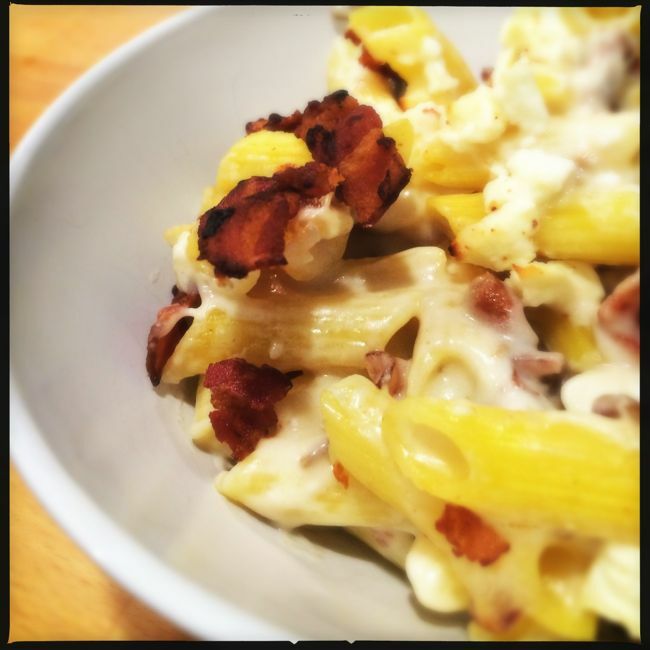 A light, creamy take on Mac and Cheese with a hint of dates adding some sweetness to the salt of the Feta and Bacon which are the stars of the show. Cook pasta according to package directions; drain well; set aside. Meanwhile, in medium saucepan, melt butter, whisk in flour and cook, stirring constantly, 1 minute. While whisking vigorously, slowly pour in milk, add dates, and whisk until well combined. Bring mixture to gentle boil, stirring constantly. Reduce heat to low and simmer about 2 minutes, stirring frequently, until thickened. Add 2/3 cup Feta Cheese and Provolone Cheese to milk mixture; cook over low heat, stirring constantly until Provolone has melted (Feta won't fully melt). Season mixture with salt and pepper to taste. Add drained pasta to sauce mixture and toss to coat; add 3/4 of diced bacon and toss. Pour mixture into buttered 11 x 7-inch baking dish. Sprinkle top evenly with remaining diced bacon and Feta Cheese. Move oven rack three racks below broiler and set oven to broil on high, cook macaroni under hot broiler until Feta Cheese is golden brown, 1 - 3 minutes, watching closely so it doesn't burn. Serve warm. In Cooking, Recipe Tags Dinner, Lunch, mac and cheese, macaroni, gluten free, Gluten, REcipe, Cookng, Casserole, Food, Healthy, Light, Feta, Bacon!